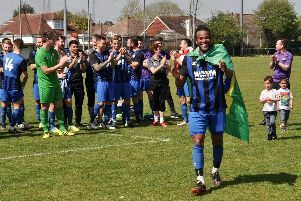 Shoreham Football Club boss Bryan O’Toole was in a positive mood after his side earned a hard-fought 2-2 draw at home to Eastbourne Town on Saturday. It was the first time this season Southern Combination League leaders Mussels had failed to win at home in the league but O’Toole viewed it as one point gained, rather than two lost on a frustrating day. With second-placed Haywards Heath not in action, Shoreham moved two points clear at the top and also have a game in hand. Third-placed Chichester are also two points behind Mussels after a 3-0 win at Newhaven on Tuesday but have also played a game more. Eastbourne took the lead through Evan Archibald on the hour but Shoreham hit back to lead 2-1 through Joe Dryer’s penalty and Rob O’Toole’s 31st goal of the season, only for Aaron Capon to earn the visitors a point. Bryan O’Toole said: “It’s a good point and if anyone had offered me four points against the team who finished second last season, I’d have taken it. “I know Haywards Heath and Chichester will be chuffed to bits we didn’t win. However, I’ve said to the players that we’re still two points clear at the top with a game in hand. “All I care about is being top of the table with a lead, whether it’s one point, five points, half a point, whatever, it doesn’t matter. “We’ve still got to play both Chichester and Haywards Heath as well and they have to beat us if they want to win the league, that’s the way I see it. Mussels struggled to break down Eastbourne Town in the first half but made a bright start to the second period and had a host of chances. Tom Burton had an effort saved and Rob O’Toole and Joe Keehan both headed over, before the visitors went ahead. Mussels defender Niall O’Hagan’s headed clearance struck team-mate Lee Denyer and fell favourably for Archibald to poke home from six yards. Shoreham responded well and levelled from the penalty spot on 68 minutes. Scott Packer was brought down and Dryer scored from the spot. Mussels went ahead seven minutes later when Packer played in Rob O’Toole, who hammered the ball home into the bottom corner. Within 60 seconds, Eastbourne levelled as Capon tapped home with Mussels appealing for offside. Shoreham then threw men forward as they hunted for a winner. Burton and Rob O’Toole went close, before Robin Deen caught a volley cleanly from close range but was denied by the visiting keeper in injury-time. Manager O’Toole said: “They came here with five at the back and we struggled to break them down in the first half. “It was a tough day but we made a bright start to the second half, only for them to go ahead with a real lucky goal. “We responded well to get 2-1 ahead and I thought we’d go on to win the game. However, within 60 seconds they equalised and my players are adamant it was offside but what can you do? I’m not going to blame the officials.